This happened on 16th of March 2012. I was browsing facebook and all of a sudden I see condolences to a family name that I am very familiar with. So I quickly asked friends back home about the cause of fatality. So one of them directed me to the news below. No one know exactly what and how the fire took place but overall I feel sorry for the family. May they find comfort in God. Kota Marudu - Police have launched an investigation after the charred remains of a senior government officer was found inside his badly burned vehicle. And, they have identified the deceased as Hilde Bin Primus @ Hilde P. Kayau, the assistant district officer (ADO) of Kota Marudu. District police chief DSP Mohd Isa Yusuff (pictured) told New Sabah Times they rushed to KM 12, Jalan Tandek-Kota Marudu upon being alerted by the public at about 4.45am yesterday and found the charred remains of Hilde inside his burned Proton Exora, a sport utility vehicle (SUV). He said they did not suspect any foul play and have classified the incident as sudden death. "We are also awaiting reports from the Forensic and Chemistry Department," he said. 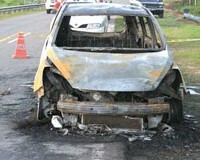 Mohd Isa said initial investigation showed that Hilde was driving home to Pitas when the car caught fire. "We were also informed that the deceased's vehicle has had wiring problem twice prior to the incident," he said. To a question, Mohd Isa said Hilde's wife who was at the scene had confirmed the charred remains was those of her husband and the vehicle belonged to him. Meanwhile, Kota Marudu MP and Minister of Science, Technology and Innovation Datuk Dr Maximus Ongkili when contacted in Kuala Lumpur yesterday said he was saddened by the incident. He urged the police to conduct a thorough probe. Dr Maximus also said the late Hilde was a good officer and well accepted by the local residents. "Hilde's death is a loss to the civil service," he said.